The potatoes can be grown in pots, tyres, buckets, tubs, barrel, wheelbarrow, a grocery bag, an old laundry basket or any container. This method is good if you don't have a large growing space in your garden and want to get an excellent yield from a very small growing area. The general procedure and tips for watering, fertilization, pests and disease problems, and harvesting are the same as described for growing them in ground. 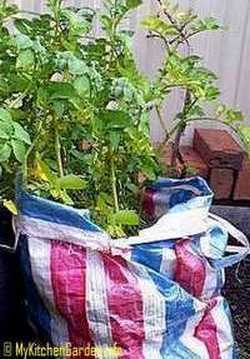 The additional tips for potato growing in pots, containers and tires are given below. This method is ideal if you don't have enough garden space. Get a container at least 40 - 50 cm deep with holes in the bottom for drainage. I have grown potatoes in an old wheelbarrow and a big grocery bag. You can also use chicken wire to make the container, half wine barrel or even an old bucket. The smaller the pots, the smaller the potatoes will grow. Put about 20 cm of potting mix and compost or composted cow manure in the pot and put seed potatoes on top, about 20 - 30 cm apart. Cover with about 20 cm of compost mixed with sugarcane mulch, grass clippings or paper clippings. Water well. As the potato shoots start to grow through, cover up with compost, straw or newspaper clippings. Keep adding more compost and mulch mix as the plants grow. Keep them covered to avoid exposing potatoes to light to avoid turning them green. Green potatoes are poisonous! Growing potatoes in tyres is very popular, but it is not a good idea because the toxins in the tyres can leach and taken up by the potato tubers. It is better to grow them in any container or pot. Take one tyre, place it on the ground and put soil and compost inside it. Place about 7 seed potatoes on top, and cover with straw and compost. When the plant grows 30-40 cm high, put another tyre on top, and continue adding straw or paper clipping until you have 3-4 stacked up. Water lightly. You can start harvesting from the top layer and remove the top tyre and after a few weeks you can harvest the next layer, and so on down to the bottom.